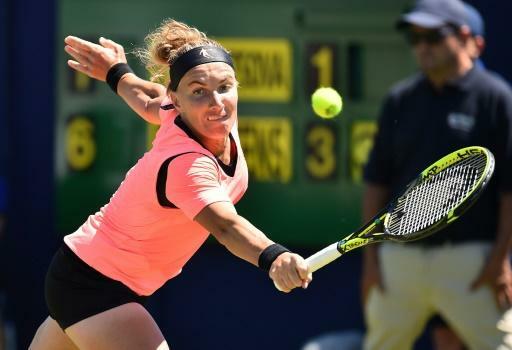 Two-time Grand Slam champion Svetlana Kuznetsova saved four match points and rallied to defeat Croatia's Donna Vekic and win her 18th career WTA title Sunday at the Washington Open. The 33-year-old Russian, ranked 128th in the world, defeated 44th-ranked Vekic 4-6, 7-6 (9/7), 6-2 for her first WTA title since 2016 in Moscow. It was also Kuznetsova's first title since left wrist surgery that had sidelined her earlier this year. "I know I've been a little bit lucky today," Kuznetsova said. Kuznetsova, winner of the 2004 US Open and 2009 French Open, claimed a second Washington title to go with the one she won in 2014, her only other appearance. "There's something going on with Washington," Kuznetsova said. "I never lose here. I played two times and I won both." Vekic, 22, won her only WTA titles in 2014 at Kuala Lumpur and last year at Nottingham. Missing out on another after coming so near left her wiping away tears on the court as she accepted a runner-up trophy following only her second final in three seasons. "Sorry for what happened today," she told coach Torben Beltz. "Hopefully we can have some more finals together. "Tennis is not an easy game. It's not easy when you lose with match points up. But I love this sport. Hopefully I can be in some more finals and win some more titles." A sympathetic Kuznetsova offered condolences, praising her effort and saying, "I'm sure your victories will come." "Tennis is a little bit difficult sport. When you lose it's really bad and when you win you have everything." Vekic had two match points in the 10th game of the second set but Kuznetsova denied her to reach a tie-breaker. Kuznetsova gave the Croatian two more match-point chances in the tie-breaker but saved each with a forehand winner before forcing a third set. Kuznetsova rolled through Vekic in the final set, leading 5-0 and breaking her in the final game to claim the crown after two hours and 31 minutes, jumping for joy in celebration.